Like the TV before it and the computer after that, at one point it may have been hard to imagine much less believe that mobile devices would be a regular part of daily life for the majority of the population. On a planet with approximately 7 billion people, 2011 saw an astonishing 5.3 billion mobile subscriptions. That’s just about 77% of the total population. It’s no wonder that mobile ad spending worldwide is predicted to top out at $3.3 billion by the end of 2011 and jump to $20.6 billion by 2015. Much of the advertising will be driven by search ads and local ads. Given those statistics one can’t ignore the opportunity to tap that ‘connected’ community through mobile marketing. I’ve put together some of the trends we have seen and might seen in the coming year when it comes to this channel of opportunity. Trend 1: Ad spending to reach the mobile segments will continue to rise. Google will likely continue to be the leader in ad revenue but look for other opportunities to present themselves with time. Bing could take a bigger share of the advertising pie as well with more and more search apps that use Bing being installed on phones and devices. Scan it, compare it, buy it at the best price, and pick it up at the store. Trend 3: Look for those bar scanner type apps to evolve even further in the coming year. This could result in some very healthy competition among retailers not to mention the possible greater risk for losing a customer to a competitor that physically walked into your store first. Imagine this. You walk into a local store, find the item you wanted, scan it with your smart phone bar code reader, find the same product less than a mile away at another store … and for a better price. You buy it by clicking a button on your mobile phone and entering your payment information. The store puts the item on hold for you to pickup. What happens next? You leave the store you originally walked into only to end up at their competitor down the road with the item in hand. How’s that for ‘shopping cart abandonment’? Expect to see this trend offset with more and more ‘price match guarantees’. Find it somewhere else and we’ll match or beat the price on the spot. Trend 4: Location based mobile marketing gains steam. Imagine being able to automatically market to a potential consumer that is in the area (but not directly inside) of your brick and mortar store. It’s not only a reality to some degree, but is a primary driver of what occurs with apps such as Foursquare, and Facebook Places. Take it a step further and consider this. A potential customer performs a search from their mobile device for a product that you offer. Like the above trend, this type of search ability should grow and if you don’t take advantage of mobile marketing based on location, you’ll be left out only to see your competitors (who take advantage of it) see the rewards. Trend 5: Consumers expect accessibility on all levels. We now live in a world where consumers no longer rely on a desktop computer (or even a laptop) to access the internet. It is becoming second nature (although still in its infancy) to browse the internet using mobile devices-and in the near future, it is said that accessing the internet via mobile devices will surpass accessing it using any other method. Determining which way to go-a mobile app or simply a website that is ‘mobile friendly’-will be the real issue. But you must make your business accessible on all levels if you are going to compete in this day and age. Trend 6: Smart phone users are on the rise and were projected to reach 73.3 million by the end of 2011. At that rate, the smart phone owners will account for approximately 23% of the mobile user population. It is estimated that by 2015 they could very well represent 43% or more. As a comparison, in 2010 smart phones accounted for 21.8 of all handsets shipped worldwide. 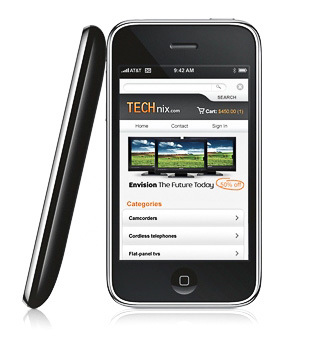 Look for potential customers to become more engaged in 2012 as the smart phone segment continues to grow. They are going to expect better, more intuitive mobile versions of websites that allow them to easily shop and find the items they seek. Trend 7: Social networking continues its dominance among mobile users. More and more users are frequenting social networking apps such as Facebook, Twitter, and Foursquare. Nielsen listed mobile social networking is the fastest-growing consumer mobile app category in 2010 and that trend continues in 2011. Many of these social networking sites are becoming portals for users accessing the internet (much like search engines were when they arrived on the scene with the advent of the internet.) Mass amounts of messaging and e-mail traffic, videos, photos, games and commerce are exchanged with each minute using these tools. If not already doing so, marketers need to begin to think about reaching out to this channel, increasing their exposure time at every possible opportunity. Trend 8: Optimizing websites for mobile platforms is a reality. No longer is it good enough to consider a ‘well optimized’ (non-mobile site version) the end all, be all. With the demands mobile is presenting to everyone, consideration needs to be given to continual optimization of a mobile site that aims for increases to speed, image rendering and again, accessibility. As was with the ‘desktop only’ site versions of what seems now long ago, on site usability and traditional search engine optimization rules should apply. What mobile has in store for us in the coming year is anyone’s guess. It is clear however that it’s shaping up for staggering-possible record breaking-growth once again that simply can’t be ignored if you are to stay competitive. Keeping with the theme of my previous article on Mobile Commerce, I recently read a number of news items that bring to light even more, the big opportunity there is in moving toward a mobile marketplace. I wanted to summarize the findings for you below. Mobile commerce (a.k.a M-Commerce) is such a rapidly growing segment I wanted to follow up my previous post with more on what is going on in this industry segment. When it came to the retail category, the data showed that nearly all shopping tasks listed had those polled overwhelmingly preferring the use of mobile access for each task. From price and product comparison shopping to sharing the finds socially, most of the mobile users preferred using a browser rather than a dedicated app for navigating. On the contrary, although mobile consumers did say they prefer the mobile browser to the mobile app for a number of shopping tasks, they also indicated they preferred using the non-mobile version of the website to actually shop when ready. When asked why this was the case, the respondents suggested a “low awareness of optimized experiences for the mobile web” (i.e. many sites are not easy to navigate when viewed on a mobile device—quite likely because the stores have not invested in a mobile version. I touched upon this very concept in my last article. On a similar note, PayPal recently unveiled its two-click mobile payment system called Mobile Express Checkout. They have been working on this for sometime, and now it’s ready for ‘live’ BETA testing. With this new system, PayPal feels they have found a viable solution to a long standing problem—that being finding a balance between security and ease of use among mobile users and apps. So far the BETA testers have reported very promising results even going so far as showing double digit sales growth from their mobile stores since implementing the feature. By early 2011, PayPal plans to give Mobile Checkout Express merchants the ability to not only accept PayPal payments, but accept credit cards as well. Here is an example of how it could be used by retailers. One of PayPal’s initial partners, Starbucks, is going to make it easy for customers to reload their Starbucks card from within the company’s iPhone app. In another report by ABI Research, it is reported that 5 billion of the world’s 6.7 billion people have active subscriptions to mobile devices. This is an astonishing fact that further shows mobile devices are as common as the television set. ABI further reports that with the introduction of high-speed 4G data technologies, subscription growth rates should stay strong even in regions which are considered ‘hyper-saturated”. In fact, by 2015, it is expected that 6.4 billion people will have mobile subscriptions and at that time, 169 million of them will be to 4G technologies. With the rapid growth of this technology and its usage rates, mobile marketers have enormous opportunity in front of them now and on the horizon. With all the talk of iPhones, apps, Blackberry’s and like minded ‘smart devices’, at some point (if you haven’t already) you need to consider when it is right to make the jump to mobile commerce. These technologies are more prevalent than ever before, and the rate of use is growing with what seems like every passing hour. Add to that the fact that mobile shopping is expected to approach $2 billion in 2010 — and top $119 billion by 2015 — and you have the makings of something that can add substantial revenue to your bottom line in the near future. Amazon CEO Jeff Bezos stated that in the past year, the company sold more than $1 billion in products to customers who shopped for those items using a mobile device. That’s a lot of cash from a trend that is rapidly increasing across the globe. Mobile commerce is here and it’s not only for the big guys. Small business owners should pay attention to this trend and get ready to take advantage of it at the earliest opportunity. Think mobile commerce isn’t for you? Think again. You might not think that mobile commerce fits your market or customer … but before you jump to that conclusion consider this. If that doesn’t make you stop and reconsider where mobile commerce could fit into your business, I’m not sure what will. So, before you write off a mobile version of your store as not worth it, do your homework first. When is it right to make a ‘mobile version’ of your store? Well that answer can depend on a lot of variables including customer demographics, budget, and cart engine technology to name a few. The biggest hurdle for many stores is going to be getting a ‘mobile version’ of their store built (and this could be a costly conversion process depending on what you want to end up with.) With the exception of custom built ecommerce platforms, the majority of ecommerce engines out there simply do not have the ability to easily convert to mobile (yet.) Yes, you can view the sites over a mobile device, but they do not ‘work’ as a true mobile application or site should. Without a mobile ready version of your store, the ability to turn visitors into sales is hindered due to what often comes down to poor usability. Reading is made difficult, navigation is unbearable and often impossible, and that is just the beginning. If you want to see what a very basic mobile version of your store might look like if you were to go that route (and I say might because this simply removes all styling and images … not very ‘pretty’ for the sophisticated smart phones of today, but it would do the trick), Google provides a conversion utility that’s as simple as it gets. Enter the URL of your website; check the option for ‘No Images’ if you do not want images to appear, and then click on the ‘GO’ button. Once Google renders your site, you can surf it to see what users would see if they came to it via a mobile browser (to some degree.) If you’ve got a mobile device of your own, you could of course access the site with that to view it as well. You can use Google Analytics to track what types of mobile devices are trying to access both your non-mobile and mobile store. Installing this type of tracking on your non-mobile site may provide you with some insight into how many visitors are actually trying to view your site via a mobile browser—and this might play a role in your determining when to address a mobile site design. Here is a nice article on setting up filters in your current website profile from within Google Analytics. The information is a little older so some of the screens for setting up the filter changed a bit but the overall concept is the same. Again, you can use the information gathered from this type of filter to determine an approximation of how many of your current visitors try to access your site via a mobile device. Keep in mind that this does not necessarily mean that if you had a mobile version they wouldn’t shop it, on the contrary, it may be that they know your site doesn’t render in a mobile browser very nicely and thus they choose the traditional internet route. To add Google Analytics tracking to the mobile ready version of your site you’ll need to adjust the code a little bit. You can find this snippet and more information about it here. When should you make the move to mobile? There is no right or wrong answer for this. As we have seen, much of it depends on variables that are very business specific. One thing you should count on however is that mobile shopping is going to be as common as the TV. To be able to take advantage of this growing medium you need to start planning now. If you can get a mobile site in place sooner than later, great! If not, don’t worry, but do consider what it will take to move toward that.